The village of Clun lies in the south western corner of Shropshire, surrounded by hills and lying alongside the River Clun. It is thought that people lived here as far back as the Bronze Age, making Clun one of the most ancient settlements of the country. For many, the area around Clun is amongst the most attractive in the county - the novelist A E Housman called it: '... one of the quietest places under the sun'. Clun is surrounded by hills, and lies alongside the banks of the River Clun. A medieval stone bridge crosses the river - narrow, because when it was built (c. 1450) it was for the use of pedestrians and packhorses. 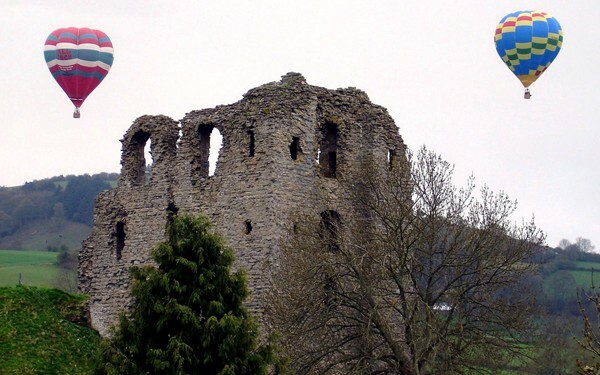 The remains of Clun Castle, built by the Normans in the early 12th century to defend the Welsh border, look down over the village. Offa's Dyke passes nearby, and there is an Iron Age hillfort (Bury Ditches) not far away. Artists and writers have often seen Clun as a quiet, ideal location - the playwright John Osborne lived here towards the end of his life, and is buried in the churchyard. The Green Man Festival is held annually in May; in a custom dating back centuries the Green Man of Clun is confronted by Frostie, the Queen of the Cold, in the Battle of the Bridge (on an ancient packhorse bridge over the River Clun).